The main pool provides plenty of entertainment, with shallow tiers for wallowing and a deep section beneath a two-storey thatched balé with a viewing platform looking out over the rice fields. At the far end of the pool the huge upper-floor games room also promises hours of fun, with its pool table, table tennis, home theatre and computer. 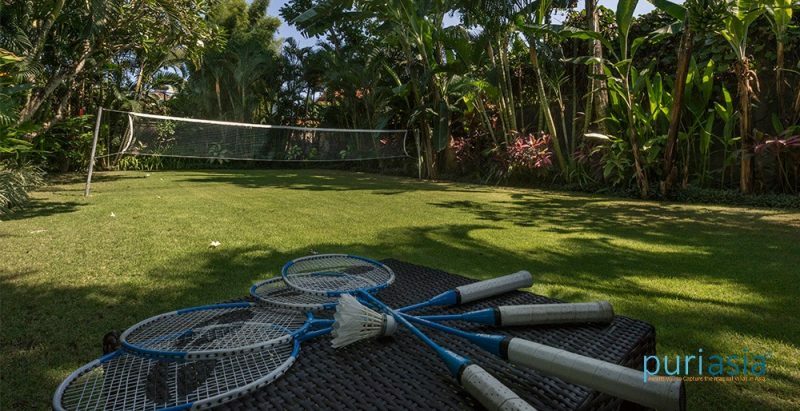 Just behind is a badminton/volleyball court – a complete kids’ zone! Below the games room, three twin bedrooms can be converted to kings making them equally suitable for adults (each also has two handy roll-away beds for extra young guests). 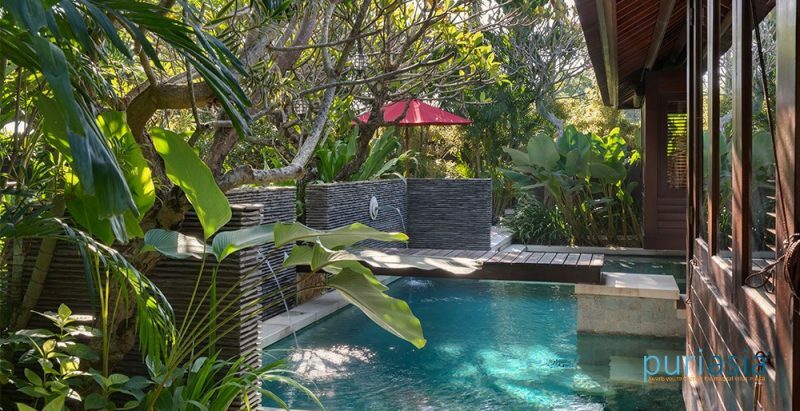 Providing a calm environment at the other end of the villa is the two-bedroomed master pavilion with its own large plunge pool. 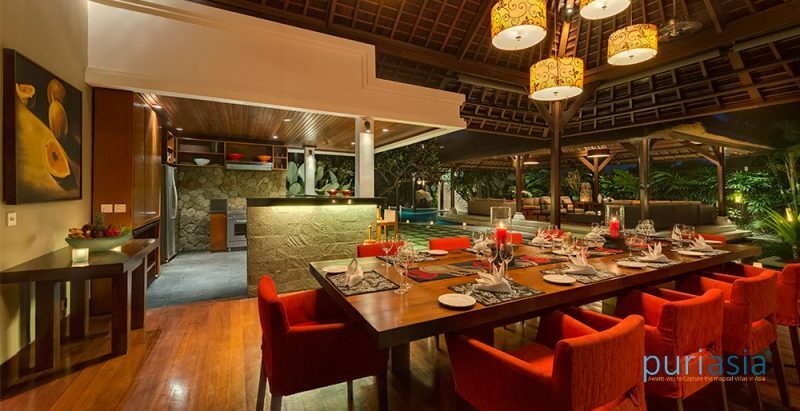 With so much on offer, there’s little call to leave the villa – especially because among the delightfully professional staff of Villa Asta is an excellent chef adept at whipping up meals that would give some of Bali’s famed restaurants a run for their money. But it’s good to know Batubelig Beach is only a short walk away, and a car and driver is available for an additional cost to whisk guests to nearby Seminyak, or further afield to explore the island. 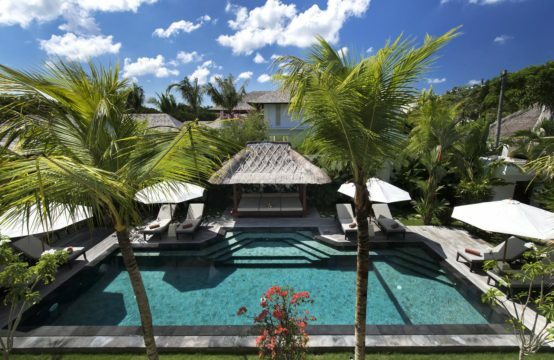 The master pavilion houses two air-conditioned bedrooms complete with ensuite bathrooms, a sun terrace and a fabulous 12-metre plunge pool with water spouts. 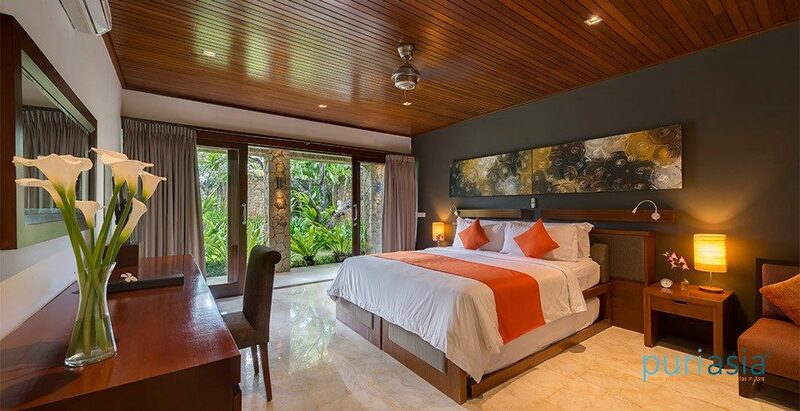 Both bedrooms are tastefully decorated with bold colours, rich fabrics, bright scatter cushions, and local artwork and artefacts. 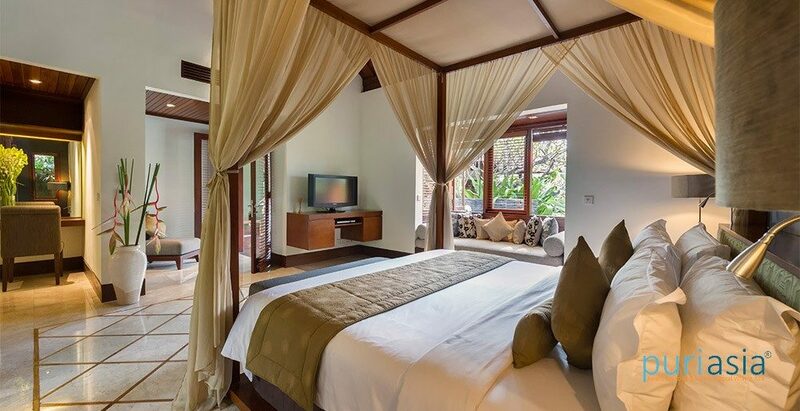 In each, a canopied four-poster king-size bed sits under a soaring thatched roof, while an extra-long window seat provides a peaceful place to relax with a book or watch the 29-inch plasma TV. 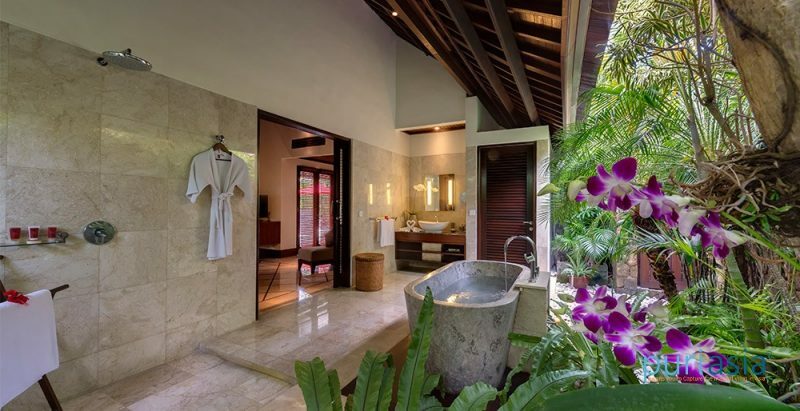 Beyond sliding glass doors are private garden bathrooms, dominated by splendid over-sized, marble bathtubs sheltered from the elements by the eaves of the roof. Doors in the garden walls lead to the plunge pool, neatly avoiding the need to walk through the bedrooms. Three guest bedroom suites occupy the ground floor of the entertainment pavilion at the far end of the garden. Accessed by sliding glass doors from a colonnaded terrace, these air-conditioned rooms have twin beds that can convert to a king, with two roll away beds tucked under. Each has the convenience of a walk-in wardrobe, and an ensuite garden bathroom with walk-in shower looking onto a traditional ’mandi’ – an urn fed by a waterspout. 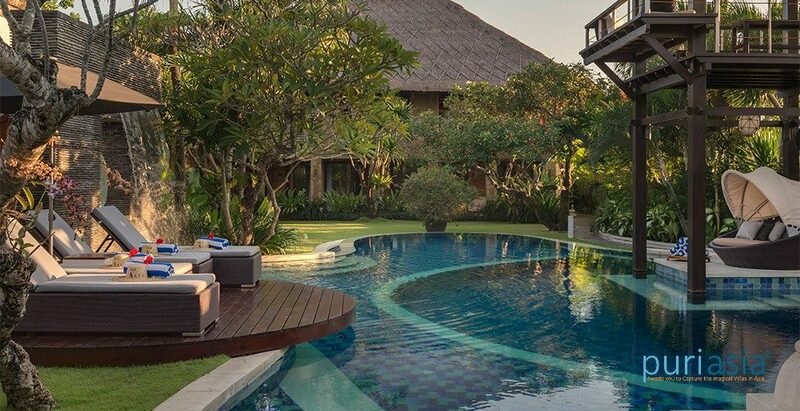 The pool-edge living pavilion is open on four sides and features a soaring alang-alang thatched roof supported by coconut-wood pillars above a floor of Palimanan stone inlaid with polished teak. Cooled by ceiling fans and gentle breezes, the living pavilion features two comfortable seating areas. A linked sound system provides music in the living, dining and games room from speakers discreetly positioned high in the roof. Across the koi pond is a second open-sided, fan-cooled pavilion and fabulous entertainment space. Taking centre-stage under pendulous lamps and paddle fans suspended from the vaulted roof is an extendable table that seats up to 18 on designer-chic upholstered chairs. 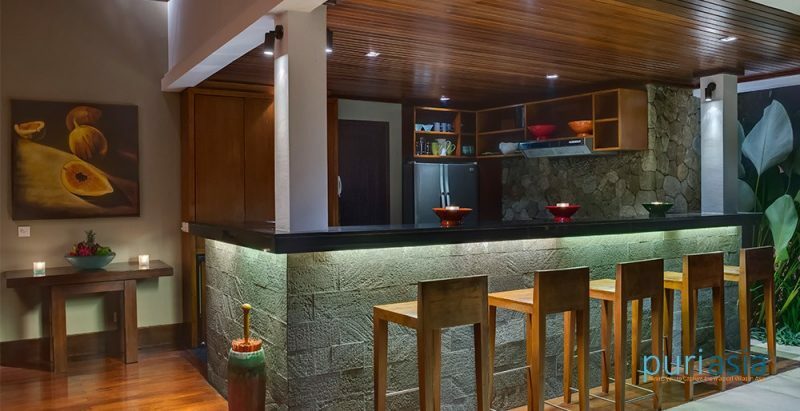 The adjacent black marble bar provides a more casual place to congregate in front of the well-equipped, open-air slate-floored service kitchen. 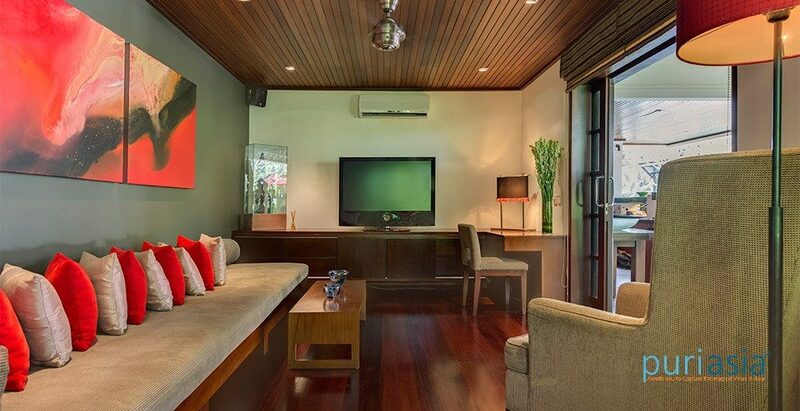 Separated from the dining area by sliding opaque glass doors is an air-conditioned TV room where a long, deeply cushioned bench and a big lazy chair encourage curling up with a good book or watching a movie on the 48-inch satellite TV. Doubling as a study, the room is equipped with a computer and printer. A magnet for kids of all ages, the semi-open-air games room located above the three guest bedrooms enjoys beautiful rice-field views. 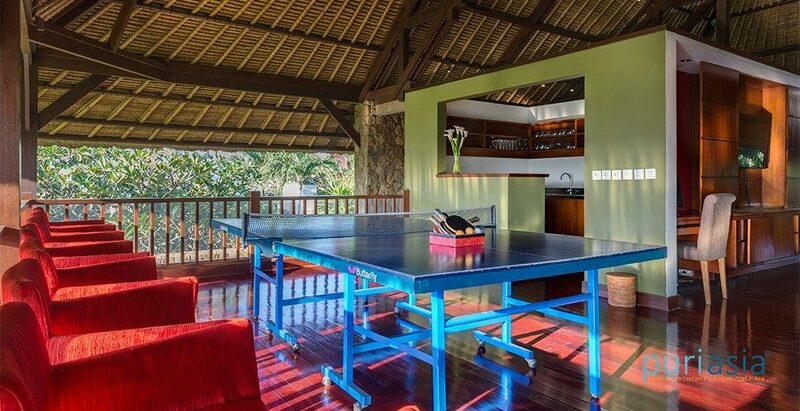 Not that anyone will be looking when there are so many distractions – pool table, table tennis, media area with a 52-inch TV and DVD player, and a computer with internet access. There’s even a kitchenette and shower room for those who can’t drag themselves away. 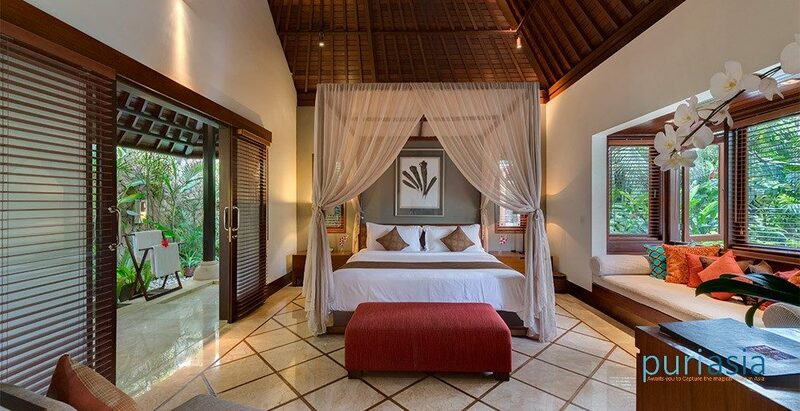 Villa Asta capacity 10 people (5 ensuite bedrooms, 2 with king-size beds, 3 with twins convertible to kings); 6 extra beds available (additional charge applies). 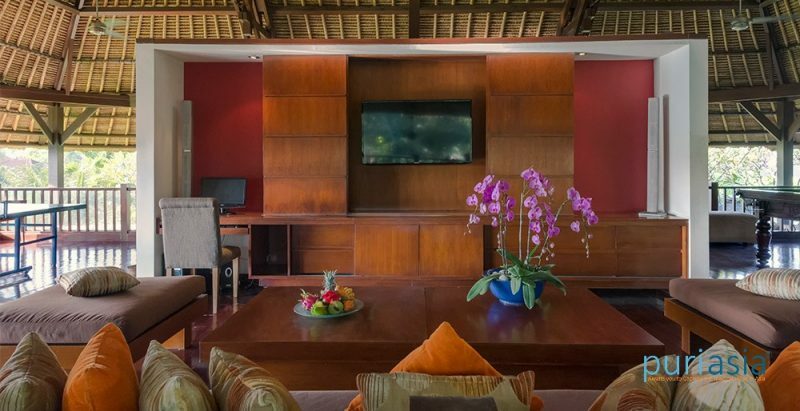 Open-sided living pavilion; open-sided dining pavilion with table for 14; air-conditioned TV room; games room; poolside balé. Villa manager; chef, cook; 24-hour butler service; gardener; security; driver. Masseuse and babysitters available on request (extra charge). A priced menu of Asian and Western cuisine. Requests accommodated (including special diets). WiFi internet access; local telephone calls (international calls charged to guests); 2 computers with printer. Satellite-channel TV; DVD players and DVD library; CD players and CD library; iPod docks; integrated sound system; magazines; book selection; board games and toys. 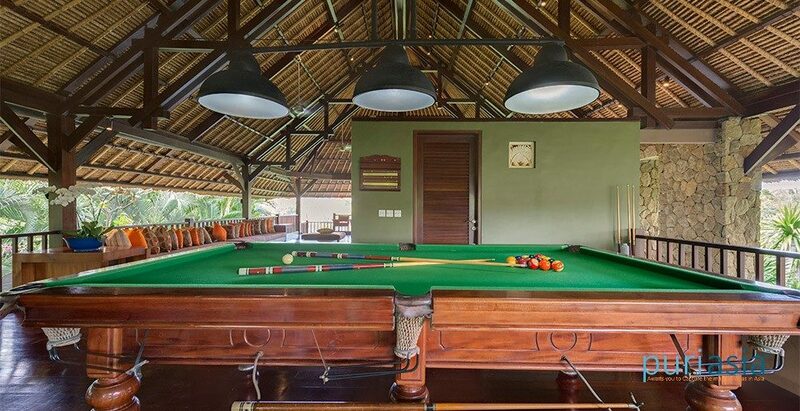 Pool table; table tennis; badminton and volleyball court and equipment; 4 bicycles. Villa Asta is exceptionally well equipped for families. Facilities include high chairs, baby cots, and playpen with toys. A 10-passenger van with driver is available on a complimentary basis for up to 10 hours a day. Petrol extra. Additional hours are charged at US$10 per hour. 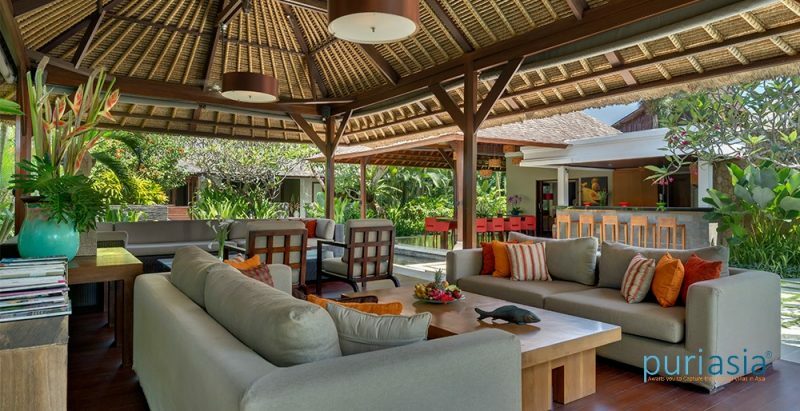 Events for up to 80 people (50 sitting) can be held within the villa’s spacious gardens. Barbecue; in-room safes; generator back-up; massage beds; guest membership of the Canggu Club.